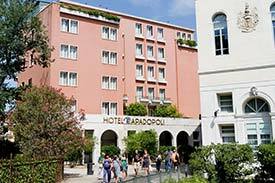 ABOVE: The Hotel Papadopoli is next to the Giardino ex Papadopoli, a public park by the Piazzale Roma and the railroad station. INSET BELOW: A gondola passes the hotel's canal entrance, and a terrace view. Location: Across a low stone bridge from the Piazzale Roma, and a short walk from the Santa Lucia Railroad Station. You're arriving or departing by cruise ship, airport bus, land taxi, or train and you want a full-service four-star hotel that doesn't require effort to reach. The Hotel Papadopoli Venezia (formerly the Sofitel) is a 96-room hotel that is named after the park and botanical gardens next door. The hotel, which is a member of the upscale MGallery Collection, looks modern on the outside but is furnished in 18th Century Venetian style. It offers a full range of four-star comforts and services, including a restaurant with a winter garden, a café-bar, 24-hour room service, and elevators. The Papadopoli's prices are fairly reasonable for a hotel in this category (at least by Venetian standards), with two caveats: Breakfast isn't always included in the rate, and you'll need to pay for Wi-Fi. From the Piazzale Roma (the arrival point for airport buses, land taxis, and the People Mover from the Marittima cruise basin and the Tronchetto parking garage), simply follow the crowd to the low stone bridge in the middle of the square. Cross the bridge, walk a few meters along a flagstone sidewalk, and you'll see the hotel on your left. From the Santa Lucia Railroad Station, turn right as you exit the station, walk a short distance along the water, and cross the rollerbag-friendly Calatrava Bridge to the Piazzale Roma. Continue along the left side of the square to the low stone bridge and follow the directions above. The overhead satellite image shows the railroad station (top), the Piazzale Roma (lower left), and the historic center of Venice (right). The Hotel Papadapoli is the building next to the large botanic garden in the middle of the photo, just to the left of the word "Monastero." In the close-up photo, you can see the Calatrava Bridge between the railroad station and the Piazzale at lower left. On the right, a bridge leads across the Rio di Nuovo Canal to the Hotel Papadopoli Venezia, which is the pink building with arches at ground level next to the botanic garden.